Are You Prepared for a Disaster? 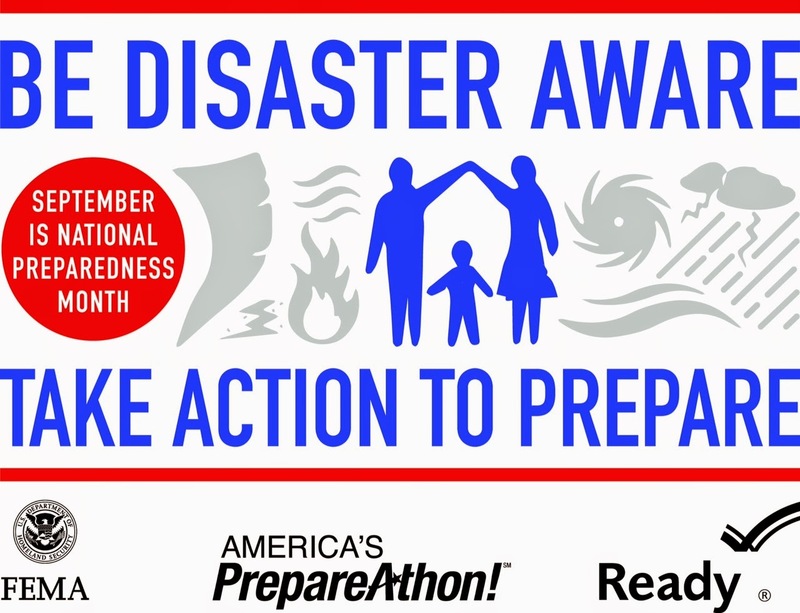 National Preparedness Month This month is National Preparedness Month for disasters, a month set aside for preparing the family for emergency situations. Given after what has happened in California last month I thought it might be helpful that I share some tips about how, as a family, we can prepare for the unexpected. This is more than having a radio or extra batteries around the house. Some situations require a plan. Disasters strike without any warning, and family members may not all be in the same place. It’s important to make a plan now so that you will know what to do, how to find each other, and how to communicate in an emergency. Here are steps on How to be Prepared for an Unexpected Disaster -Start with holding a family meeting to discuss and make a plan. Remember everyone needs to be on the same page. Although disasters can be scary remaining calm and knowing you have a plan is important. -The first thing you should do is make a communication plan. How will your family connect? How will you get in touch with each other? Pick one designated person to get a check in with. A family member that lives out of state will be a perfect person who will be able to keep communication with. Talk about phones being out of service. Discourage tying up phone lines for emergency workers and encourage using text messaging. -To this generation it is important to take some time to have all household numbers memorized. Do not rely on cell phone contacts to store all of your numbers. Encourage children and teens to still memorize numbers to essential people that are part of your plan. Although we live in a digital age, cell phones can get damaged in water and batteries can die. -Where will you reunite? Depending on the disaster the location can vary. Agree mutually on one place to meet that is out of the neighborhood in case your home or apartment is unable to be traveled to. Agree to save cell phone batteries after time and turn phones off. Before doing this create disaster check in times so when traveling family members can be assured of your safety and/or needs along the way. Pick a time to touch base again with the same person for each family member to call. Consider email as an option. Visit Ready Gov Disasters may strike. The rain may come down. The world may be crazy at times but remind everyone to remain calm and stick to the plan. Elizabeth Norton is admin of NJ Digital Moms and is a believer in people and in change!